The Ultimate Black Bottom Cupcake Recipe? I think this is it. Or at least, it’s a pretty decent hybrid. It’s a combination of Magnolia Bakery’s and Cook’s Country’s recipe. Two great recipes that come together to make one Ultimate Black Bottom Cupcake. As mentioned earlier, the problem I had with the Cook’s Country recipe was that the pretty white filling sank down into the cupcake. And while the cross section looked great, the top didn’t have enough white on it. The problem with the Magnolia cupcake, and in hindsight it really wasn’t a problem just a nitpick, was that the yolk in the cheese filling/topping made the topping brown a little bit too much. Combining the two recipes resulted in a fairly white top which didn’t sink plus a very flavorful cake base (Magnolia’s). If you try it, let me know. The only problem with the recipe is that you might have a little filling left over. One more note. I don’t like the way those mini chocolate chips feel in my mouth so I’m going to stick with normal size chocolate chips. They didn’t cause any sinkage and using normal size lets you choose from a wider variety of chocolate chip brands. 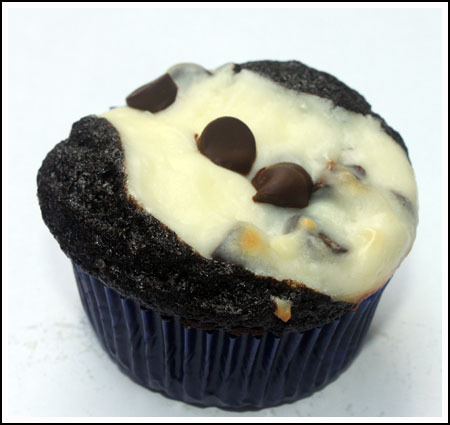 My favorite recipe for cupcakes with cream cheese and chocolate chips. Preheat oven to 350 degrees F. and line 18 muffin cups with paper liners. Beat the cream cheese, sugar and salt until smooth. Add the egg whites and stir or beat on low speed just until mixed; stir in the sour cream and chocolate chips. Set aside. In the actual mixing bowl, beat together the oil and sugar. You can do this with a whisk, spoon or hand-held mixer. Mix together the buttermilk and vanilla. Add the buttermilk/vanilla mixture and the flour alternately to the sugar/oil mixture. Stir until smooth – be careful not to overbeat. Divide the chocolate batter evenly among the muffin tins. Spoon large tablespoonfuls of cream cheese batter over the chocolate batter. You should have some cream cheese batter leftover. I just made these and they look and taste awesome! I decided to mix some extra chocolate chips into the chocolate cake batter, and I liked the way it turned out. I plan on replacing the vegetable oil with butter next time to make the cake a little more rich and moist, and using closer to 2 or 3 tablespoons of cream cheese batter for each cupcake instead of just 1 (I probably failed to mix my batter to the right consistency, so it didn’t sink much & there wasn’t enough of it in the cakes for my taste). This is definitely a great recipe! i have not had a blackbottom since our best friend died of cancer. he dee i wil make him some for christmas for you.miss you. Thanks for the review, Bethany! Whenever I take these to places, people ask for the recipe. The only reminder I give people is to be careful and really aerate the flour before measuring. Made these tonight- they are definitely ULTIMATE. We have a local bakery that makes yummy ones and I have tried several recipes to make them like the bakery. I no longer have to look- this recipe is perfect! Thank you!! Hi I just wanted to stop by and say thank you for posting this recipe but mostly thank you for doing all of the work for us and coming up with tje besy black botyoms ever. Just like the Melanie before me I chosr this tecipe purely on looks alone I’m a bit of a presentation snob. I’ve made the several times and have been told by all who have tried them that they are the best cupcakes they’ve ever had. Thanks again. can see why these made the 2010 top ten! how would you adjust the baking time to use a mini cupcake pan? thanks! I made these cupcakes for my son’s b’day. I gave him a couple of choices to choose from. Everyone loved the cupcakes!! Now I want to try my old recipe and do a comparison. Next week it’s the CI recipe with the ganache! Anna — I made these last week and they were AMAZING (even without the chocolate chips). I had to put them in the freezer to keep from eating them all. I hope to blog about them soon, but just wanted to drop you a note to say amazing recipe! Nyssa, sorry I am just now responding to your comment but THANKS for the review. I am happy you tested my hybrid version and liked it. Whitney, did you use a lower fat cream cheese? I’m glad the black bottom cupcakes were delicious anyway, but that’s interesting that the top didn’t sink even a little. Mine sunk a little, as opposed to when I made the Cook’s Country recipe and the filling sunk a lot. Sandi, good luck with your bridging. I think Fuzz will be doing that next year when she goes from Brownie to Junior. I just love the look of these. I have to bake cupcakes for a bridging event for Girl Scouts and we always have the same old ones.Well let me tell you, the girls will all have brownie lips this year..>LOL SANDI. I made these cupcakes, but the cream cheese filling didn’t sink! It stayed right on top and cracked as they cupcakes cooked…any ideas why? Still delicious though! Anna, I made these last night and my roommates loved them. We are in the middle of final exams, so these were the perfect treat. I used all the cream cheese mixture and they turned out great. I made your Ultimate Black Bottom Cupcakes yesterday and let me tell you *sing song voice* AMAZING! I swear they taste better the next day, I think it’s because the cheesecake flavour develops a bit more overnight. I ended up making a batch of your One Bowl Cocoa Brownies and used the leftover cheesecake to swirl through. OMG, tastagasm…. So keep up the excellent work!! Gwen, I would love the “goofy cupcakes”. I guess my problem with these sinking is that they’re almost too rich to be frosted. Since they’re too rich to be frosted, the filling sinks into the middle and leaves kind of a little depression in the top. I wonder if your old goofy cupcakes are as rich as this one? I’m trying to imagine what these would be like frosted. I find it interesting that one of your requirements for this cupcake is that the cream cheese shows on the top… I have a very similar recipe that I made frequently as a kid and the cream cheese sunk – on purpose. 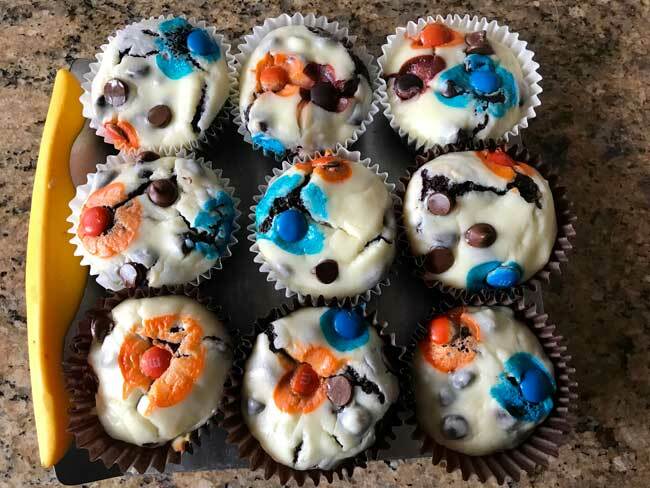 They were called “goofy cupcakes” and the cream cheese bit was supposed to be a surprise so a filling that sunk just to the middle of the cupcake was considered perfect. Then they got frosted with chocolate icing so that no one knew, until they took a bite, that they weren’t just plain ol’ chocolate cupcakes. I look forward to reading your blog every single day – thank you for sharing all of your delicious recipes with us. And that cookie name is hilarious, thanks for the laugh! Ok, so I have a question for you. I read your blog all the time, along with some other foodie sites as well. I just wondering what you guys do with all the sweets you bake- does your family eat them? Do you make smaller portions? Or do you usually end up bringing them to events? Those cupcakes look fantastic! I am going to have to give these a try….so delicious looking! Wow, those look delicious! I have a party to attend this weekend, so now I have a dliemma, I was planning on taking RR peanut butter fudge chunk (or whatever that is called) chocolate-y peanut butter-y things, but those look so good, I’m considering taking your black bottom cupcakes. anna, don’t think I’ve ever made these before, maybe a cheesecake form at some point. but they do look good. Love the name! I haven’t made black bottoms in a long time so I think I’ll give these a try. I love that the recipe uses egg whites, I’m always happy for uses for leftover egg whites! Anna – I made your one-bowl cocoa brownies for like the 3rd time for a potluck thing and let me tell you – THEY ROCK. I love that they make a huge 9×13 batch. I love that you can throw in whatever you like – peanut butter, chocolate chips, nuts – whatever. And everybody can’t stop eating them. I’ve become a brownie rockstar. They are SO easy and so cheap! I can’t afford to melt a ton of chocolate bars right now, but I can afford cocoa powder. Thanks! If you ever need good mini chocolate chips, King Arthur sells Guittard mini chips and they’re delicious. The Nestle are bland and waxy. I am absolutely drooling over this! It looks so delicious!